The Korea Herald is publishing a series of interviews on promising startups in the financial technology industry. This is the 22nd installment. -- Ed. Foreign short selling activities on South Korea’s stock market have recently been growing, and with such a trend, there is a Korean startup offering a more comprehensive look into the short selling market landscape in Korea. Short selling refers to the act of selling stocks without owning them in hopes the value goes down. To do so, a short seller borrows assets from a certain entity, sells them, then repurchases the assets to return them to the lender. The short seller gains profit when the value of the assets depreciates. A void of cushion from losses through the investment scheme has hampered retail Korean investors’ attempts at short selling securities. Short selling transactions account for less than 5 percent of the entire trading in Korea and short selling without borrowing stocks are prohibited, while such activities are highly monitored and uniquely tracked by authorities. Local retail investors’ call for all-out ban on short selling has been relentlessly intensifying, on the grounds that they can suffer damage on such investment schemes that are virtually exclusive for institutional investors. 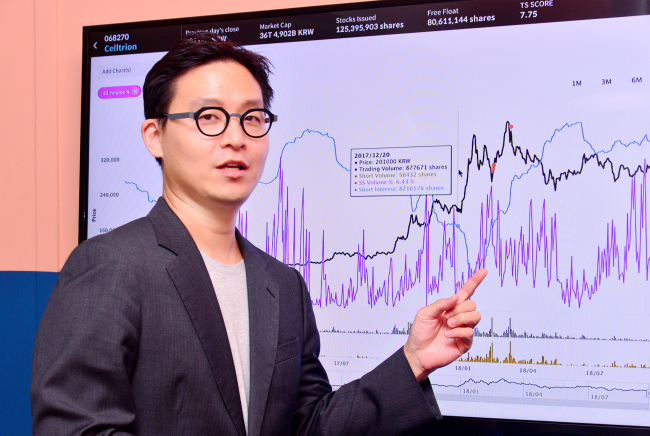 Ha Jae-woo, founder and chief executive of fintech startup True Short, aims to provide what both sides -- individuals and institutions -- will find essential in keeping up with being informed of the trend in local stock market. By launching an English version of True Short in August, two months after its official launch in Korean, the 39-year-old expressed hopes that the service will reach out to foreign investors including hedge funds. “Foreign hedge funds will realize that we process and visualize raw data related to short-selling, so that they could save the energy of tracking and collecting them on their own,” Ha said in an interview with The Korea Herald. Shares worth 55.1 trillion won ($49.4 billion) were short sold from May 22 until end-September this year combined across the top-tier Kospi and second-tier Kosdaq market, up 56.9 percent compared to a year prior, according to data compiled by the Korea Exchange. The KRX began to compile information about short selling transactions from May 22, 2017. In particular, short selling transactions on Kosdaq jumped threefold. The increase was mainly driven by hedge funds and institutional investors, whose short selling transactions rose 42 percent on-year over the cited period. Roughly 7 out of 10 short selling activities were conducted by foreign investors throughout this year in Korea. On the other hand, Ha maintained his views that the individual investors in Korea will also benefit by subscribing to its service, in that data from True Short will contribute to building “a level-playing field” on the local short selling market. For example, repetitive trends will help subscribers to its service predict the timing of short selling by foreign investors, so individuals can take pre-emptive actions from an expected stock price downturn. He added that private bankers, facing a “limited data pool for investor reference,” are also frequent customers. Founded in 2015 in Hong Kong, True Short is designed to provide repeating trends of investors in short position not only on Korean securities markets but also on a certain publicly traded company. It tracks the ratio of daily short sale volume, daily trading volume, volume of securities loans outstanding, days it takes to cover the borrowed stocks and short interest -- the number of shares that have been sold short but have yet to be covered. 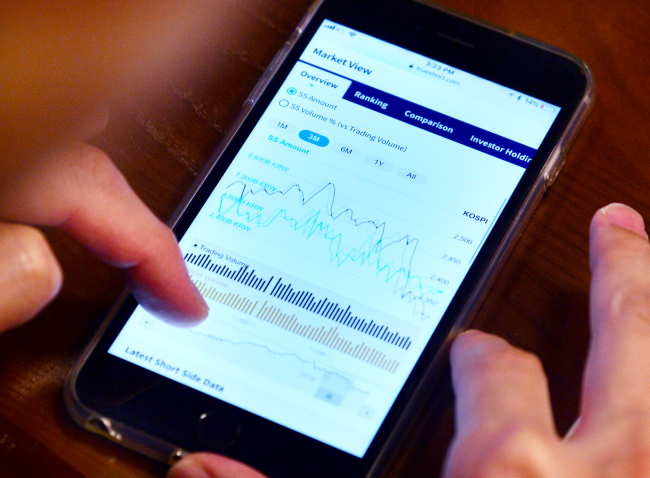 Using the information, the startup offers a glimpse of the most commonly shorted stocks or the tendency of short selling in a market. The information is presented through visualized tools including a chronological graph. Also, by teaming up with US financial services provider FIS, True Short provides another set of information targeting institutional investors. They include loan balance percentage, loan availability, loan utilization and average borrow rate for the security, all provided by FIS, also known as Fidelity National Information Service. Formerly a dealer devoted to short selling and securities finance from 2006 to 2015 at Morgan Stanley Asia Pacific, headquartered in Hong Kong, Ha currently works with four other employees and is in the final stage to close its first funding deal from venture capitalists. Data related to securities loan outstanding is brought from the Korea Financial Investment Association, while those associated with short interest is taken from the KRX, both according to financial market rules in Korea. Such use of data certified by authorities gives True Short data an upper edge against competitors in global financial data analytics market, he said.